A family-owned and -operated establishment, B.T.J.’s Jungle has been your one-stop pet shop for more than 45 years. Conveniently located on Sunrise Highway in West Islip, New York, we are Long Island’s best one-stop pet store for everything you and your family might need in the way of pet supplies and services. In fact, we stock supplies for just about every pet you could imagine, including cats, dogs, birds, fish and even reptiles! At B.T.J.’s, we also guarantee to match any price advertised by our competitors. 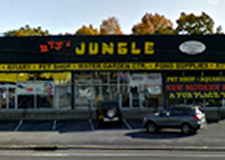 B.T.J.’s Jungle has also won numerous awards, such as “The Best Reptile Store on Long Island” by “Bethpage Best of Long Island,” and has consistently upheld an A+ rating with the Better Business Bureau. Our pet shop has become so popular that we were featured twice on the hit TV show Extreme Makeover: Home Edition! Additionally, we offer outstanding home pond and water garden services that encompass water garden and pond design, maintenance, and installation by our highly qualified pond experts. For more than four decades, our experts have been able to complete the most beautiful ponds and waterfalls to complement the landscaped yards of all our customers. Our water garden design team can work with you to design the perfect custom pond or waterfall. If you can dream, then we can build it! Our ponds are pet-friendly, and can even become the home to some of our exclusive Japanese koi fish. Come down to our pet store today and experience why B.T.J.’s Jungle is the best pet store on Long Island! You’re welcomed to scroll through our website to see all we have to offer. For more information, you can also fill out our convenient online contact form or simply give us a call at 631-587-8191. We look forward to hearing from you soon!